Shown above is the most expensive chassis’s available in the 1939 range, that of the ’78 series. 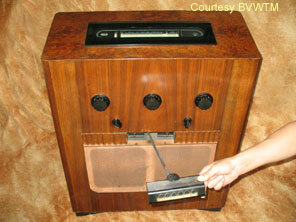 This model was the special short wave performance and special reproduction model. Unlike the other models in the 1939 range, the A78C was fitted with remote control as standard. The drum tuning principle is still utilised, together with a black glass escutcheon, which to my mind is not quite as impressive as the mirrored version seen on the A40C. The remote control has already been discussed having been fitted as an optional extra to the A76. Two large chassis’s are utilised in the A78C. 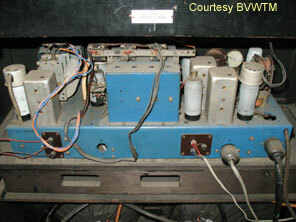 The tuner chassis (pictured below left) is housed at the top of the cabinet. 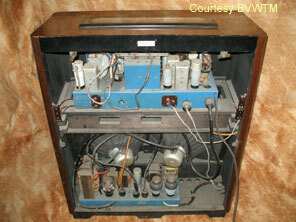 The chassis at the base of the cabinet (pictured below right) carries the power components and rectifier, together with a pair of PEN45’s in push-pull configuration. The PEN45’s in push-pull deliver the sound through a pair of loudspeakers on angled baffles, which radiate the sound into the listening room in two slightly differing planes thereby ensuring maximum penetration. There are no known surviving examples of the A78RG (unless you know different – in which case email me!). 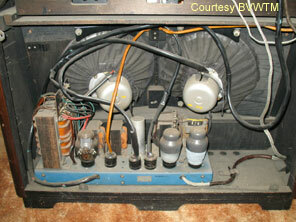 Although a very impressive receiver, the A78C is considered to sound inferior to the A40C from two years earlier.